The southern live oak, Quercus virginiana, is found in the southeast United States. The one pictured above is an over 300 year old oak in Tallahassee, FL, that started its growth to the sky around when Shakespeare was busy in England. 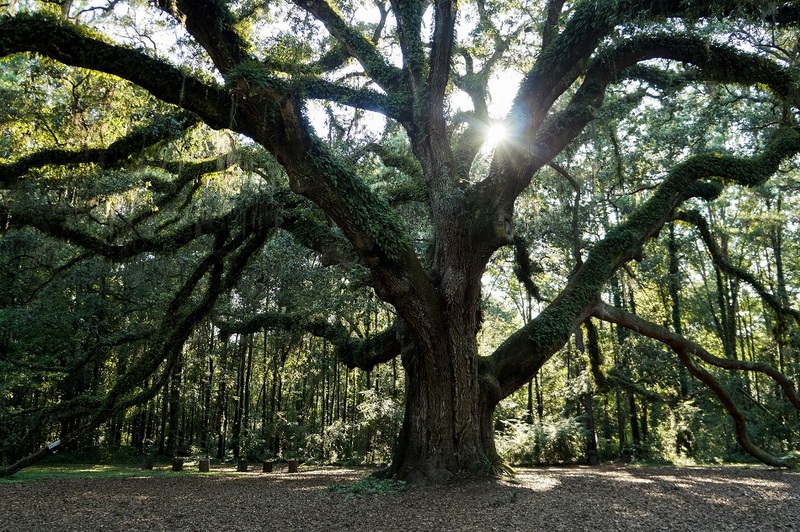 The live oak hosts a community on its sprawling limbs. 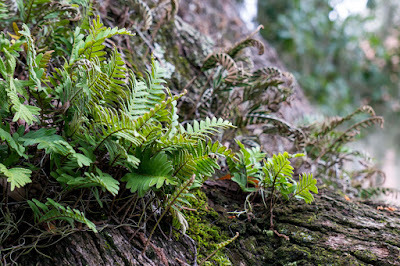 One species that makes its home on the oak is the resurrection fern, Polypodium polypodioides. The resurrection fern is an epiphyte — an organism that lives on another living organism without negatively impacting the host. Air and rain nourish the epiphyte, but the resurrection fern can still survive when some of those nutrients are in short supply. The resurrection fern gets its name from its exceptional resistance to drought. During drought times, the fern will dry and shrivel as it loses up to around 75 percent of the water in its cells. However, the fern is far from dead. When rain comes, the resurrection fern is revived by absorbing water into its cells to look as healthy as it ever was. 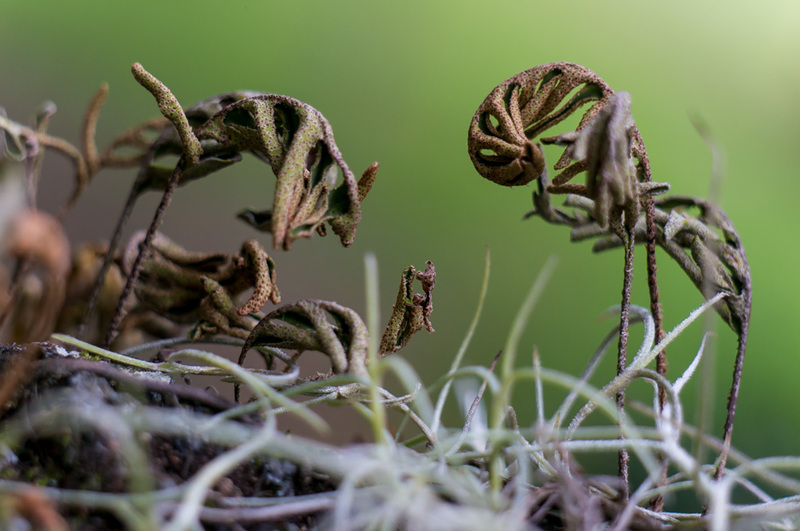 Above, shriveled resurrection fern waiting for some rain. 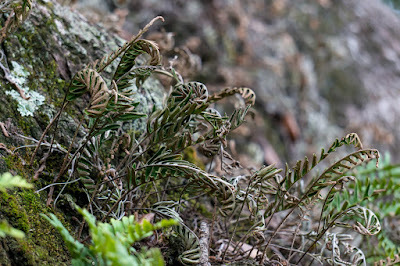 Above, resurrection fern that is partially dry and partially revived. Above, resurrection fern in foreground that is fully revived after receiving moisture. Even more life, in forms that aren’t visible to the naked eye, call the live oak community home. Stems, leaves, and flowers host microorganisms, creating a habitat called a phyllosphere. The phyllosphere of a plant is considered a rough place for microorganisms to live, compared to other habitats like a dung pile, because there is a lot of variation in UV radiation, temperature, water, and nutrient contents. The phyllosphere of the epiphyte (such as the resurrection fern) is considered even more extreme due to the mercurial environmental conditions around the epiphyte. Microorganisms do make it in the phyllosphere of the resurrection fern, though, even during its dry periods. The researchers of Jackson et al. 2006 in "Changes in the phyllosphere community of the resurrection fern, Polypodium polypodioides, associated with rainfall and wetting" found that the community of microorganisms changes as the resurrection fern moves from a dry state to wet state. Additionally, they found that certain populations of microorganisms increase their enzyme activity after the fern revives. Likely, these microorganisms are responding to the secretion of yummy organics (like sugars) released through the plant's surface once the plant itself is back to a lively, green state. Jackson, Evelyn F., Haley L. Echlin, and Colin R. Jackson. 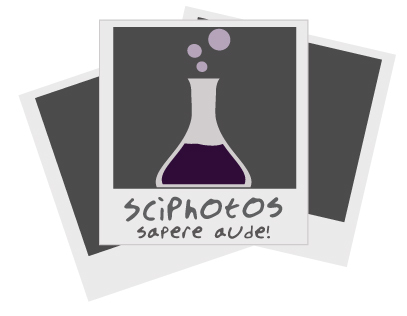 "Changes in the phyllosphere community of the resurrection fern, Polypodium polypodioides, associated with rainfall and wetting." FEMS microbiology ecology 58.2 (2006): 236-246.